Glitz Design: Show Me the Glitz!!! Happy Monday everyone!! This week I have a fun little feature that I hope our blog readers will participate in. I want to see YOUR favorite creations with Glitz Design product!! I will pick three projects to share, right here on the Glitz Design blog, on Friday!! 3. Please comment by Wednesday morning, because in the afternoon I will be selecting the projects and sending out emails to confirm it is okay to post the images to the blog. Easy as pie, huh? 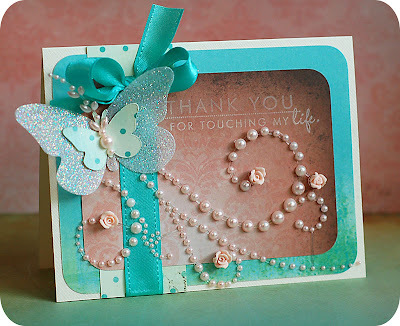 I can't wait to see what you have created using Glitz Design product...so get to linking!! So, we can't have a post without a project, right? So I thought that I would share one of my favorite Glitz Design cards that I have created in the past, and it has actually never been featured on the blog before!! So, I figured it was a good time to share it. Here you go!! How exciting, and a great chance for us all to see other fabulous Glitz work! Here is my favourite that I have up at the moment. This is one of the prettiest cards I have seen! Thanks for sharing! Thanks for expressing interest in projects that everyone has done. Your card is amazing! I love it! Your work and your blog inspire me so much. thanks for that. Cool chance - here's my favorite Glitz project, it's inspired by a project that I saw on your website. Best Friends featuring Love Nest pps . The latest Glitz Designs have hit our sunny shores ! Just scrapped some today with Love Games ! I love love love soooo much Glitz products!! We do need help from around the world.